Celebrate with a trio of marvelous Harry & David™ wines, all grown and crafted here in Southern Oregon, where the climate is ideal. There is the light, expressive 2015 Pinot Noir; robust 2017 Cabernet Sauvignon; and medium-bodied, lush 2016 Chardonnay. 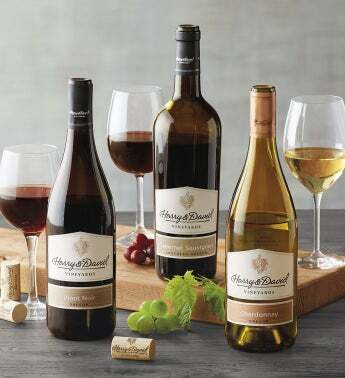 Be sure to have these wines on hand for unexpected guests, or take them to your next event as a welcome hostess gift.